For the most heart-warming, inspiring, and creative experience to ever have within the city limits of Ann Arbor, I suggest you volunteer with 826 Michigan. 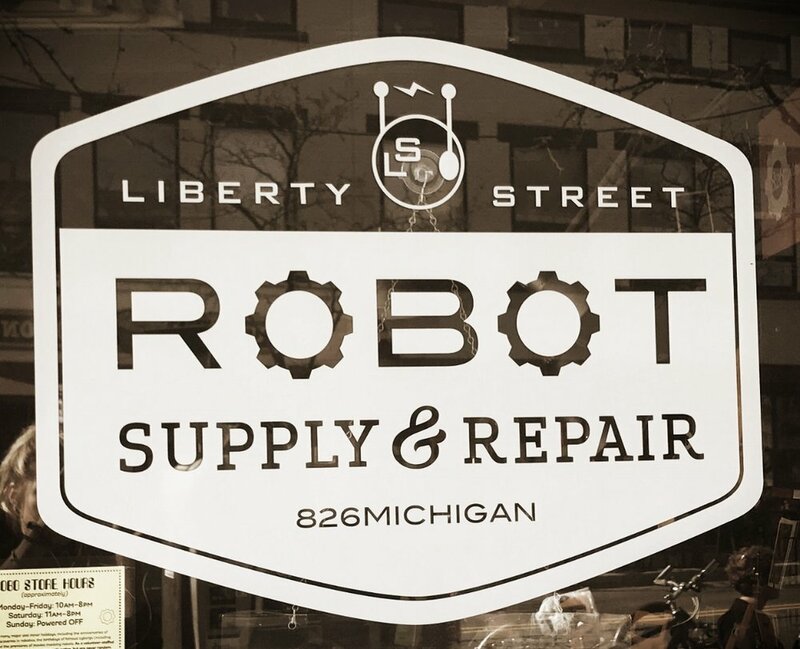 The Robot Shop first entered my radar while enjoying Midnight Madness on Main Street. The event is an Ann Arbor winter tradition when downtown shops bring their best holiday cheer. In doing so, glitzy red and green lights, painted storefronts, and classic Christmas music fill the air. One can only imagine the amount of visual and audio stimulation that goes on, but when my ears directed me to a group of humans and ugly sweater-wearing robots singing carols, I knew I found something extraordinary. It was then I learned that the quirky Robot Shop was not for fixing broken ‘bots, but instead a creative retreat where school-aged children of all levels can practice and share their writing. For all of these reasons, I reached out to 826 Michigan’s Executive Director Amanda Uhle to learn more. She gracefully obliged to answering my questions, so now I pass on this information to you. Enjoy! 1. When did you officially open the doors of 826 Michigan? We first opened—on South State street—in June 2005. Much has changed since then! We’ve been downtown on Liberty Street since 2007 and now have a second location—in Detroit’s Eastern Market—and a thriving presence in Ypsilanti as well, along with a larger budget and staff size to match. 2. What do you feel 826 Michigan offers the community of Ann Arbor? We serve 4,000 school-aged students and help prepare them for extraordinary futures. Sometimes—thanks to our focus on one-on-one support—it feels like we serve our students 4,000 different, beautiful ways. Because we engage hundreds of adults as our volunteer tutors, students receive help that’s individualized to their needs whether they’re working on a tricky algebra assignment, defeating writer’s block with an idea for a humorous short story, or building a college application essay. And while our programs take many forms—tutoring, in-school writing support, creative writing workshops, publishing, and more—our students all come away with one, important thing: the sense that more is possible than they’d previously imagined. Instilling the idea in young people that their world is vast and that possibilities are endless is an important part of why our students feel connected here, why our volunteers are engaged, and why our community supports this work. 3. If you were allowed to choose only one novel to take on a trip, which one would it be? I’m always reading a novel and can’t even estimate how many I’ve read in adulthood or narrow down to a short list of favorites. The best novel to take along on a trip would probably come from one of two categories: something I hadn’t read from a trusted, beloved writer whose work always clicks for me or something else entirely new, ideally by a writer who can take my brain to an untold frontier I’ve never imagined. Either would work well! But you could ask my husband this and learn that for every trip I’ve ever taken, I’ve overpacked books, keeping my options wide open, usually at the detriment of something essential, like shoes. 4. If you could have one last, indulgent meal in Ann Arbor, where would it be and what would you order? I have to admit that my favorite place to eat in Ann Arbor is my own home, because it means I got to spend some time with my own thoughts in the kitchen, and I’m sitting around my table or my yard with my favorite people. If I’m going out, I love the Lunch Room and 826michigan’s neighbor Spencer for fresh and delicious and creative things. For a special dinner, I gravitate to Mani if I plan ahead enough to get in. 5. Where is your favorite place in Ann Arbor to kick your feet up and relax? I’m a big fan of Morgan & York, which is near where I live. I’m an unrepentant, near constant coffee drinker, and theirs is top notch. Their recent renovation means you can enjoy their coffee (and pick up some wine and cheese for later) in a cozy setting, perfect for reading or writing or even catching up on work. Their big front windows make the room seem sunny even on overcast days, and the sense of community in the room always feels good. My other favorite relaxing places in Ann Arbor don’t serve coffee; Bird Hills and County Farm Park come to mind as ideal spots to let your mind and body wander. 6. In one word, how would you describe the Ann Arbor community?